An intoxicating rich blend of Hungarian Paprika, stone ground mustard, kosher salt, garlic, onions, turmeric and parsley with hints of traditional hickory smoke. Artisan crafted and perfected for the avid boomer (or non-boomer) consciously seeking richer flavors that maintain a low glycemic/diabetic (sugar) index without sacrificing daily key nutrients. This Dry Rub contains ZERO "0" Sugar and is instead ALL flavor. This dry spice rub is great at adding a pinch of flavor to every day chicken meals, sauteed potatoes and onions, baby back ribs or to perk up scrambled eggs. Simmer with rice, green peppers and tomatoes or coat generously on grilled pork or prawns. Enhance the flavor of beef, chicken, fish, or your very own barbecue sauce and salsa creations. Get yourself the flavor and rubs you deserve now with this special combination. San Ysidro SFR Sugar Free Rub: Chicken, Grilled Chicken Wings, BBQ ribs, fish, pork, turkey, steaks and more. 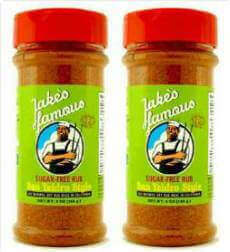 Order Jake's San Ysidro Style (SFR) Dry Rub Now and kick your bbq dry rub skills into high gear. 5% Of All Sales Donated To Charity.